What I want to cover here is not the situation in Venezuela itself, but the state of media reporting on the situation, and the lack of any scrutiny of US propaganda regarding Venezuela. Let’s return to Tienditas Bridge. The Venezuelan people desperately need humanitarian aid. The US & other countries are trying to help, but #Venezuela’s military under Maduro’s orders is blocking aid with trucks and shipping tankers. The Maduro regime must LET THE AID REACH THE STARVING PEOPLE. The photo depicts Tienditas International Bridge, blocked by a fence, a few concrete blocks, two containers and an oil tanker. 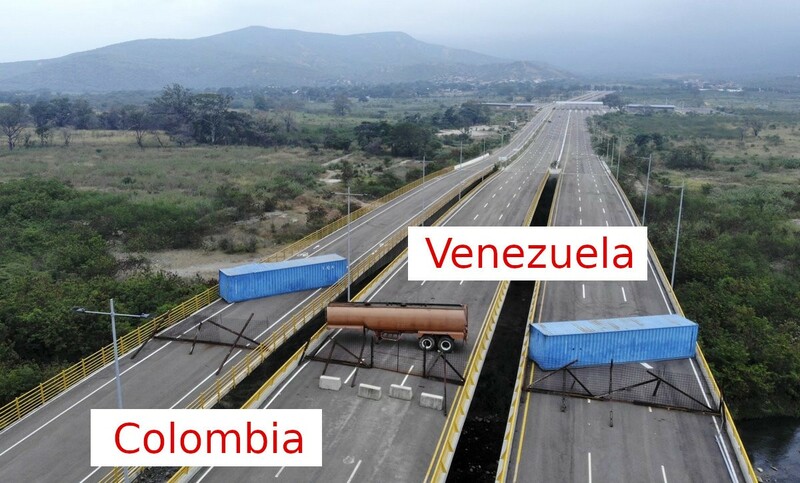 This photo along with Pompeo’s words paint an image of Maduro as a mad dictator who does not care about the people of his country, and is willing to shut down and blockade a huge six-lane highway in order to stop them eating. In the day or so following Pompeo’s tweet, every mainstream news outlet reported on this story, but it appears none of the writers bothered to question the narrative put out by Mike Pompeo. Most of the stories were incorrect and omitted key facts, as I will show. Here are a selection of the reports. I’ve highlighted the inaccuracies. - Every news organisation takes a journalistic position which is in some way biased, but mostly aligned with the propaganda the US government is putting out. -The 24-hour news cycle leaves little time for the journalists to put in the necessary research to verify the facts they are publishing. It’s a sad state of affairs. I feel I can no longer trust anything I read in the media, and have to verify everything myself. In this case, there was enough information available online to do that and find the errors and omissions, but that usually isn’t feasible. It’s certainly not how I want to spend my time. I’m not a journalist. The Venezuelan government led by the elected president, Nicolás Maduro, is concerned that this will be a cover for shipping weapons into the country which may be used to start a civil war. This is not an unreasonable concern given the US’s history of interventionism, and the Venezuelan authorities claim to discovered an illegal shipment of rifles and ammunition from Miami just this week. Faced with such a threat, it seems quite rational to secure the points of entry through which arms could enter the country. Since Tienditas Bridge is not in use and has never been, it makes sense to reinforce the existing barrier on the bridge (which may be have been erected by Colombia). The quality of output in the media feels lower than I remember it ever being. I felt despair today as I realised how deceptive this coverage of Tienditas Bridge has been. I don’t know whether the authors intend to deceive or are unaware of the role they play as puppets of the US government’s propaganda.